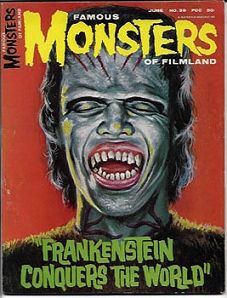 June 1966 issue of FM featuring cover from "Frankenstein Conquers the World". This copy has one staple exposed but is otherwise near-mint. Even though the cover art looks like Mick Jagger in Frankenstein monster make-up, it's actually a Japanese actor, badly in need of some dental work. Website design and hosting by Sohodojo Business Services. Item 107 of 466 items displayed in viewer. 0 items in cart.